Last evening in Dilli, this trip… Time to say Goodbye to the MeraBharatMahaan Park…. Oh yes! This park sure represents a nice cross-section of urban India… Consumer Marketing folks can test market their products here, and model consumer demand for the rest of the Metro… Election Surveyors can get a good sample here for their Poll predictions…. And Law makers can get a good understanding of how they are faring…. Ha! You are wondering about the last one? 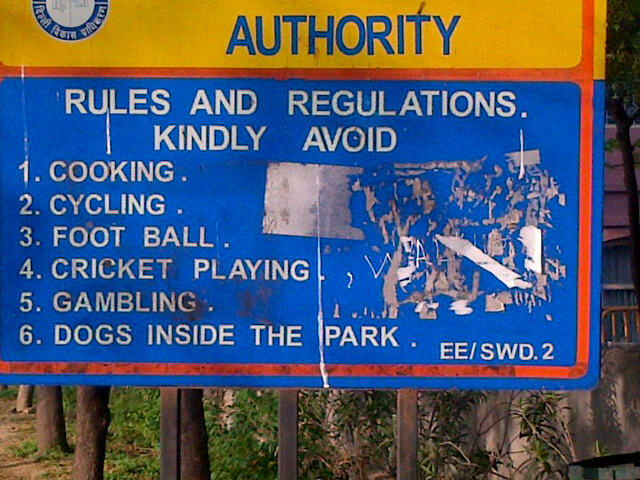 The local Govt body has put up this board… Right at the entrance. 1) Avoid Cooking: Generally complied with…. One doesn’t see people cooking. But then again, there is a small jhuggie colony at one corner of the park…. They live there…. Among other things, they need to cook…. Now, how can one say ‘no’ to that? 2) Avoid Cycling: Generally complied with…. But young kids do bring in small bicycles…. Cute little bicycles… Now, how can one say ‘no’ to that? 4) Avoid Cricket Playing: Not complied. A nice cricket match is in progress. With a tree as a wicket… Its tennis ball cricket though… So no one will get hurt… It’s fun…. Can one say ‘no’ to that…. 5) Avoid Gambling: Complied… How does one make out if someone is gambling though… Some folks do seem to be playing cards… Looks like a nice family picnic… Sure looks like no one is gambling… Safe to bet on that…. 6) Avoid dogs inside the park: Complied! 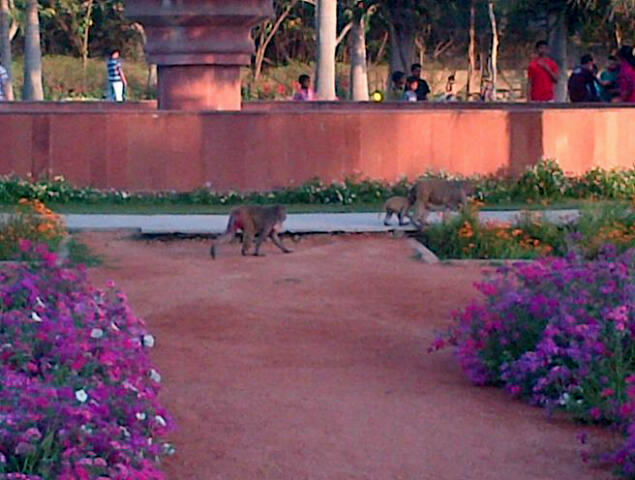 Many stray dogs are ensuring that other dogs do not come inside the park… Bow Wow Wow ! And more Bow! All right… No dogs… But what is this? Now tell me…. How can one say ‘no’ to that? This entry was posted on March 17, 2013 at 1:22 pm and is filed under Uncategorized. You can follow any responses to this entry through the RSS 2.0 feed. Both comments and pings are currently closed. Kamesh, enjoyed reading through the 3-part series! Went through your blog and had a great time with your humor, creativity, depth, poetic expression and light-heartedness. Learnt much about places in Tamilnadu, near chennai and places near Bangalore and delhi. While going through your Himalayan trip, I relived our recent trip to Himalayas, Rishikesh, Badrinath, Joshimath and Ganges. Sivananda, Sivananda, Sivananda hoon! Har haal mein, al mast sachidaanand hoon!